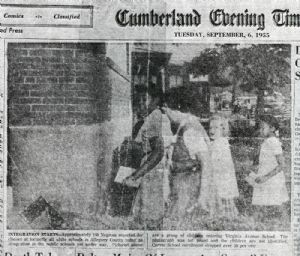 As noted in this front page Cumberland Evening Times article, school integration began in Allegany County on September 6, 1955 when 150 "Negroes" reported for classes at formerly all white county schools. Enrollment at the Carver School for black students dropped over 50 percent. These four children, two white and two black, were actually neighborhood friends and playmates walking to the Virginia Avenue School together for the first time. From left to right is Carole Williams, Belle Riggs, Nancy Logsdon, and Juanita Williams, now Juanita Cage Lewis. In a 2004 interview for the Maryland Public Television production of, "People of Brown, 50 Years After Brown v. Board of Education", Juanita notes that for her, integration was not that difficult on the elementary school level. There were no stones thrown and no racial slurs. She considered herself fortunate in this regard that she did not have the problems other people of color did in integrating their schools. Although many blacks continued to go to Carver until its closing, Juanita felt that she and others benefited from integration in that people had a chance to participate in various activities together and visit each other's homes. Juanita went on to attend Allegany High School which had about four blacks in her graduation year. Juanita notes that she found it odd that it was only later, after she left Cumberland and moved to Annapolis that she experienced racism first-hand. This was when she noticed that people in the stores would follow her around in fear that a "woman of color" was going to steal something. Juanita had lived in a variety of other States (with no problems) before settling in Annapolis. This included North Carolina. She was initially afraid when she moved there but no one "messed with her". Juanita attended classes at Fayetteville State (now University.) Once when she was walking around downtown Fayetteville she came upon a structure "in the round" at one end of the main street of the city. It was only then that she became a little scared when she realized that this was the spot where the slaves were auctioned off. CUMBERLAND — One of six women to be recognized by the Dr. Martin Luther King Jr. Committee Inc. this week at a ceremony in Annapolis is Cumberland native Juanita Cage Lewis, committee chairman Carl Snowden announced Monday. Lewis will be presented the prestigious Fannie Lou Hamer Award on Sunday at a 4 p.m. ceremony at St. John’s College, Francis Key Auditorium, 60 College Ave. The 17th Annual Fannie Lou Hamer Reception and Awards program honors women from various racial backgrounds who, in the opinion of the Dr. Martin Luther King Committee, have demonstrated a propensity for social justice. The annual reception is the only reception in the state that celebrates the birthday of the late Mrs. Hamer, who won national acclaim after making a passionate speech before the 1964 National Democratic Convention describing in graphic details the efforts that were taken to deny her and other African-Americans the right to vote. Lewis is the customer service manager and ombudsman for the Maryland Department of Housing and Community Development. In 2011, Secretary Raymond Skinner awarded her with the agency’s Gold Medal Award for Excellence. She began her career in state government in 1984 with the Department of Economic and Community Development, Appalachian Regional Commission. Later she was assigned to staff the Housing Development Advisory Service. When the department was renamed the Department of Housing and Community Development, Lewis was assigned to work in the Office of the Secretary with the legislative liaison. She later became the customer service communications coordinator and was also one of the Citizen Response Team members under former Govs. William Donald Schaefer and Parris Glendening. Lewis also worked with the legislative team during Gov. Robert Ehrlich’s term and received citations of excellence from the governor for her work on the Hurricane Isabel Relief Act. Lewis is a graduate of Fayetteville State University in North Carolina and resides in Annapolis with her husband, Cliff Lewis. The couple have three children and eight grandchildren.